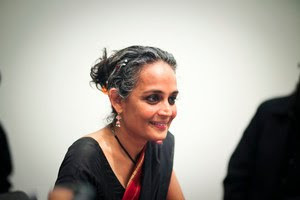 Arundhati Roy. Photograph © Jeanbaptistparis/Flickr. Today The New York Times ran this Op-Ed by Arundhati Roy. And DemocracyNow! ran this interview with her today as well. Roy is a smart, articulate, courageous woman. And that, on top of being a wondrously talented writer. She has, over the course of a decade or so, become a vigorous critic of a host of policies pursued by the Indian government and of uncontrolled globalization. Indeed, she is especially adept at pointing out how the two are intimately intertwined. And she regularly calls attention to the plight of those - typically the poorest Indians - who get squeezed as the Indian state intersects with neo-liberal political economics. This has gotten her into political and legal trouble on several occasions. Most recently she has spoken forcefully about the ongoing violence in Kashmir in ways that have many demanding that she be charged and tried for sedition. But Roy has defenders as well. And much of the discussion about her and the criticisms she voices ought better be focused on Kashmir and the problems there to which she is calling attention. Those problems are complex, as is the way forward. (For a slew of recent reports and essays on Kashmir from The Guardian and The New York Times look here and here.) Roy herself acknowledges as much even as she insists that the way forward must be democratic and pluralist. But complaining about Arundhati Roy is a way of blaming the messenger instead of attending to the message. Interviews with . . .